Research Interests. My research lies at the interface of mathematics and biology, and encompasses two distinct arenas of exploration: (1) mathematical systems biology, and (2) algorithm design and numerical analysis for the stochastic models arising in systems biology. 2018 -- Appointed Vilas Distinguished Achievement Professor. 2018 -- Graduate student Jinsu Kim earned his PhD on May 8th. 2016 -- Vilas Associates Award. 2015 -- Graduate student Yu Sun earned his PhD on December 15th. 2014 -- Awarded the IMA Prize in Mathematics from the Institute for Mathematics and its Applications (IMA). 2014 -- Graduate student Elizabeth Wolf earned her PhD on May 14th. 2013 -- Graduate student Masanori Koyama earned his Phd on December 16th. Masanori Koyama, PhD in December, 2013. Elizabeth Skubak Wolf, PhD in May, 2014. Yu Sun, PhD in December, 2015. Jinsu Kim, PhD in May, 2018. 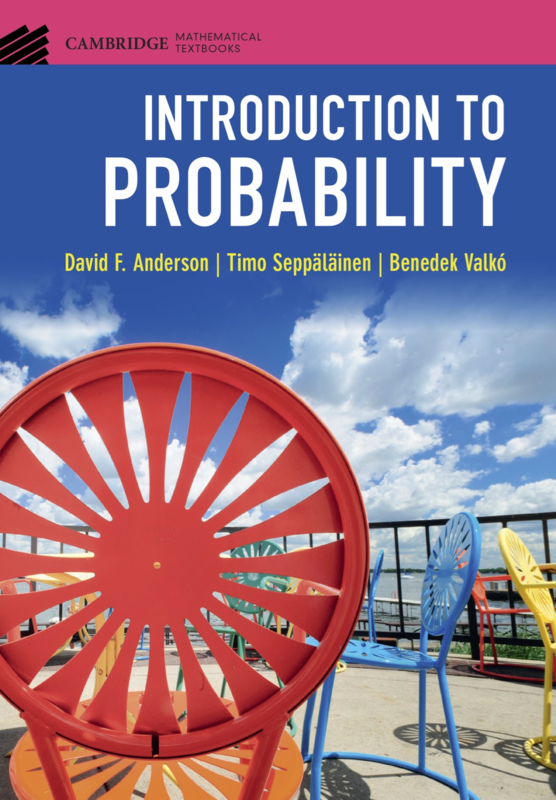 Fall 2018 teaching: Math 733, Introduction to Probability I.
David F. Anderson, Timo Seppäläinen, and Benedek Valko, Introduction to Probability, University of Cambridge Press, 2017. David F. Anderson, Daniele Cappelletti, and Jinsu Kim, Stochastically modeled weakly reversible reaction networks with a single linkage class, submitted, 2019. David F. Anderson, Desmond J. Higham, Saul C. Leite, and Ruth J. Williams, Constrained Langevin Equations and (Bio)Chemical Reaction Networks, SIAM Multiscale Modeling & Simulation, Vol. 17, No. 1, 2019. David F. Anderson and Tung D. Nguyen, Results on stochastic reaction networks with non-mass action kinetics, accepted to Mathematical Biosciences and Engineering, 2019. David F. Anderson, Daniele Cappelletti, Andres Ortiz-Munoz, and Erik Winfree, Stochastic chemical reaction networks for approximating arbitrary probability distributions, submitted, 2018. David F. Anderson and Daniele Cappelletti, Discrepancies between extinction events and boundary equilibria in reaction networks, submitted, 2018. David F. Anderson, Daniele Cappelletti, Jinsu Kim, and Tung Nguyen, Tier structure of strongly endotactic reaction networks, submitted, 2018. David F. Anderson and Chaojie Yuan, Low variance couplings for stochastic models of intracellular processes with time-dependent rate functions, Bulletin of Mathematical Biology, 2018. David F. Anderson and Jinsu Kim, Some network conditions for positive recurrence of stochastically modeled reaction networks, Vol. 78, Issue 5, 2692-2713, 2018. David F. Anderson, Daniele Cappelletti, Masanori Koyama, and Thomas G. Kurtz, Non-explosivity of stochastically modeled reaction networks that are complex balanced, Bulletin of Mathematical Biology, Vol. 80, Issue 10, 2561-2579, 2018. David F. Anderson, Desmond J. Higham, and Yu Sun, Computational complexity analysis for Monte Carlo approximations of classically scaled population processes, SIAM Multiscale Modeling & Simulation, Vol. 16, No. 3, pp. 1206-1226, 2018. David F. Anderson, Radek Erban, Tomislav Plesa, and Konstantinos C. Zygalakis, Noise control for synthetic biology, Journal of the Royal Society Interface, journal weblink, Vol. 15, No. 144, 2018. David F. Anderson, Robert Brijder, Gheorghe Craciun, and Matthew D. Johnston, Conditions for extinction events in chemical reaction networks with discrete state spaces, Journal of Mathematical Biology, Vol. 76, Issue 6, 1535 - 1558, 2018. David F. Anderson, Daniele Cappelletti, and Thomas G. Kurtz, Finite time distributions of stochastically modeled chemical systems with absolute concentration robustness, SIAM J. Applied Dynamical Systems, Vol. 16, No. 3, 1309 - 1339, 2017. Nataliya G. Batina, Christopher J. Crnich, David F. Anderson, and Dörte D.V. Döpfer, Identifying Conditions for Elimination and Epidemic Potential of Methicillin-resistant Staphylococcus aureus in Nursing Homes, Antimicrobial Resistance & Infection Control, Vol. 5, Issue 32, 2016. David F. Anderson, Joke Blom, Michel Mandjes, Halldora Thorsdottir, and Koen De Turck, A functional central limit theorem for a Markov-modulated infinite-server queue, Methodology and Computing in Applied Probability, Vol. 18, Issue 1, 153-168, 2016. Nataliya G. Batina, Christopher J. Crnich, David F. Anderson, and Dörte D.V. Döpfer, Models to Predict Prevalence and Transition Dynamics of Methicillin-resistant Staphylococcus aureus in Community Nursing Homes, American Journal of Infection Control, Vol. 44, No. 5, 507 - 514, 2016. David F. Anderson, Desmond J. Higham, and Yu Sun, Multilevel Monte Carlo for stochastic differential equations with small noise, SIAM Journal on Numerical Analysis, Vol. 54, No. 2, 505 - 529, 2016. David F. Anderson, Gheorghe Craciun, Manoj Gopalkrishnan, and Carsten Wiuf, Lyapunov functions, stationary distributions, and non-equilibrium potential for reaction networks, Bulletin of Mathematical Biology, Vol. 77, Issue 9, 1744 - 1767, 2015. David F. Anderson and Elizabeth Skubak Wolf, Hybrid Pathwise Sensitivity Methods for Discrete Stochastic Models of Chemical Reaction Systems, Journal of Chemical Physics, Vol. 142, 034103, 2015. David F. Anderson and Masanori Koyama, An asymptotic relationship between coupling methods for stochastically modeled population processes, IMA Journal of Numerical Analysis, Vol. 35, No. 4, 1757 - 1778, 2015. David F. Anderson, Bard Ermentrout, and Peter J. Thomas, Stochastic Representations of Ion Channel Kinetics and Exact Stochastic Simulation of Neuronal Dynamics, Journal for Computational Neuroscience, Vol. 38, Issue 1, 67-82, 2015. David F. Anderson, Desmond J. Higham, and Yu Sun, Complexity of Multilevel Monte Carlo Tau-Leaping, SIAM Journal on Numerical Analysis, Vol. 52, Issue 6, 3106–3127, 2014. David F. Anderson, Germán Enciso, and Matthew D. Johnston, Stochastic analysis of biochemical reaction networks with absolute concentration robustness (official web-link), with Supplementary Material (including proofs, and statements of the most general theorems), Journal of the Royal Society Interface, Vol. 11, 20130943, February 12, 2014. Rishi Srivastava, David F. Anderson, and James B. Rawlings, Comparison of finite difference based methods to obtain sensitivities of stochastic chemical kinetic models, Journal of Chemical Physics, Vol. 138, No. 7, 074110, 2013. Elizabeth Skubak Wolf and David F. Anderson, A finite difference method for estimating second order parameter sensitivities of discrete stochastic chemical reaction networks, Journal of Chemical Physics, Vol. 137, No. 22, 224112, 2012. 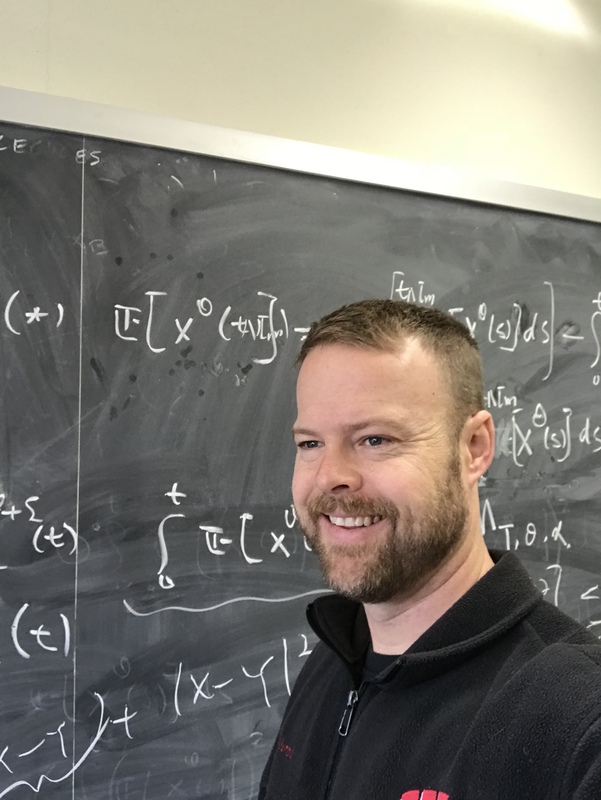 David F. Anderson, An Efficient Finite Difference Method for Parameter Sensitivities of Continuous Time Markov Chains, SIAM Journal on Numerical Analysis, Vol. 50, Issue 5, 2237 - 2258, 2012. David F. Anderson and Masanori Koyama, Weak error analysis of numerical methods for stochastic models of population processes, SIAM: Multiscale Modeling and Simulation, Vol. 10, No. 4, 1493 - 1524, 2012. David F. Anderson and Desmond J. Higham, Multilevel Monte Carlo for continuous time Markov chains, with applications in biochemical kinetics, SIAM: Multiscale Modeling and Simulation, Vol. 10, No. 1, 146 - 179, 2012. Matlab files for the implementation of MLMC on the dimerization model given on page 169 of the MLMC paper can be found here: MLMC_DIMER_public.zip. David F. Anderson, A proof of the Global Attractor Conjecture in the single linkage class case, SIAM J. Appl. Math., Vol. 71, No. 4, 1487-1508, 2011. David F. Anderson, Boundedness of trajectories for weakly reversible, single linkage class reaction systems, Journal of Mathematical Chemistry, Vol. 49, No. 10, 2275 - 2290, 2011. David F. Anderson and Thomas G. Kurtz, Continuous time Markov chain models for chemical reaction networks, chapter in Design and Analysis of Biomolecular Circuits: Engineering Approaches to Systems and Synthetic Biology, H. Koeppl et al. (eds. ), Springer, 2011. David F. Anderson and Jonathan C. Mattingly, A weak trapezoidal method for a class of stochastic differential equations, Communications in Mathematical Sciences, Vol. 9, No. 1, 301 - 318, March 2011. David F. Anderson, Arnab Ganguly, and Thomas G. Kurtz, Error analysis of tau-leap simulation methods, Annals of Applied Probability, Vol. 21, No. 6, 2226 - 2262, 2011. David F. Anderson, Gheorghe Craciun, and Thomas G. Kurtz, Product-form stationary distributions for deficiency zero chemical reaction networks, Bulletin of Mathematical Biology, Vol. 72, No. 8, 1947 - 1970, 2010. David F. Anderson and Anne Shiu, The dynamics of weakly reversible population processes near facets, SIAM J. Appl. Math., Vol. 70, No. 6, 1840 - 1858, January 2010. David F. Anderson, Global asymptotic stability for a class of nonlinear chemical equations, SIAM J. Appl. Math., Vol. 68, No. 5, pgs. 1464 - 1476, May 2008. David F. Anderson, Incorporating postleap checks in tau-leaping, Journal of Chemical Physics, Vol 128, No. 5, 054103, February 2008. David F. Anderson, A modified Next Reaction Method for simulating chemical systems with time dependent propensities and delays, Journal of Chemical Physics, Vol. 127, No. 21, 214107, December 2007. David F. Anderson and Jonathan C. Mattingly, Propagation of Fluctuations in Biochemical Reaction Systems, II: Nonlinear Chains, IET Systems Biology, 1(6), 313 - 325, November 2007. David F. Anderson, Jonathan C. Mattingly, H. Frederik Nijhout, Michael Reed, Propagation of Fluctuations in Biochemical Systems, I: Linear SSC Networks, Bulletin of Mathematical Biology, Vol. 69, No. 6, 1791 - 1813, August 2007. H. Frederik Nijhout, Michael C. Reed, David F. Anderson, Jonathan C. Mattingly, S. Jill James, and Cornelia M. Ulrich, Long-Range Allosteric Interactions between the Folate and Methionine Cycles Stabilize DNA Methylation Reaction Rate, Epigenetics, 1(2), 81 - 87, April/May 2006. A short note on the Lyapunov function for complex-balanced chemical reaction networks, 2014.